Theirs is the sacred duty of delivering justice. Theirs are the tools of venom and stealth. Theirs is the burden of silence. 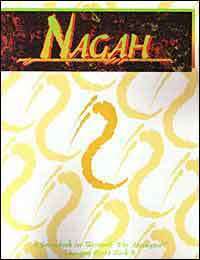 They are the Nagah, the sinister serpent-folk of the World of Darkness. For millenia, they have carried out their duties in perfect secrecy, bringing death to those that have earned it without leaving a single scrap of evidence of their existence behind... until now. The final Changing Breed Book delves into the mysteries of the most enigmatic and reclusive shapeshifters of all - the deadly Nagah wereserpents. Their history and culture, their secret tricks of assassination, the tragedies that haunt the race - are revealed within.